Our company has an app that can be downloaded through a website using Enterprise Distribution. 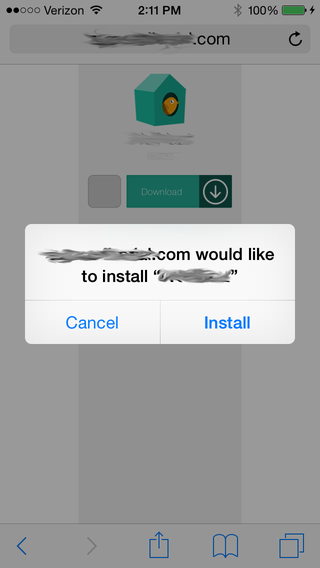 In iOS 8 Beta 5, tapping the download link brings up the expected pop-up "(website) would like to install (App Name)". Tapping 'install' on that dialog first causes the app to get stuck "Waiting..."
Until it finally indicates: "Unable to Download App (app name) could not be downloaded at this time." Installing works as expected using iOS 7. Running the app from Xcode under iOS 8 works. How do we support Enterprise Distribution iOS 8? Hit Edit - > Generate -> Download Rebuild the application with the new profile. I hope your issue is a profile problem otherwise we may have to wait until tonight 1800GMT to see if apple have fixed it. 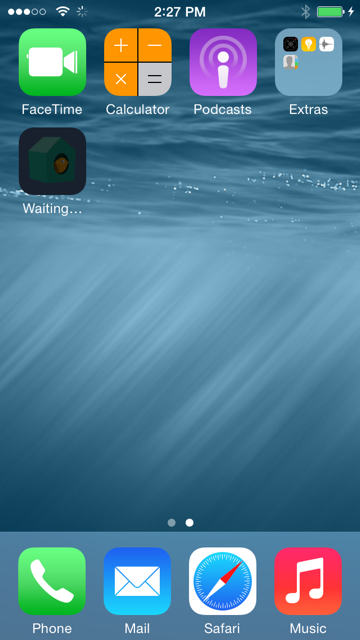 With iOS8 GM - I just get Waiting... - I will keep you informed with the bug report progress. If you see the application get into the installing... stage as opposed to loading... almost certainly the problem is the embedded provisioning profile has expired, to fix the download you will need to re-archive you application with a new, updated provisioning profile. And by the end I just changed the name of the plist and the link to download the ipa (probably the second is not needed), and finally the app gets installed. Finally it seems that it was a Cache problem in IOs8 that considers the app was already installed (and that was not the case, I uninstalled it previously). Same error here, I have tried changing bundle-id, bundle-version, plist... but the error remains. I just had this problem right now and it was caused by the mainfest plist (keys: full-size-image + display-image) are pointing at url image locations that do not exist. It looks like that iOS6/iOS7 are able to handle if the images do not exist but iOS8 is more restrictive about this. Based on previous comments on the "ignore manifest download" message, we tried changing the bundle ID (ie com.companyName.AppName) in the .plist to have a unique name, to force iOS 8 to download/install it anyway. After it gets installed, it correctly replaces the existing copy. I believe there are 2 problems going on here. If the .plist on the https website pointing to the enterprise certificate signed .ipa file has a bundle-identifier matching an application that's already installed, it won't overwrite it. The bundle-version is different on all our .plist files, so it should install it anyway. iOS 7 doesn't seem to have this issue. We plan to work around this issue by messing up the bundle-identifier in the plist so it's always unique to the build. The second issue is that when it is successfully installing the application, it doesn't switch to the home screen or indicate it's doing anything at all. In iOS 7, after selecting the "Install" button at the prompt, would switch to the Home screen where the icon would be dark, and a progress indicator would show downloading progress. Then the application would have a blue dot next to it indicating it was new. With iOS 8, it doesn't switch to the Home screen so it appears to be not working. You can manually go to the home screen, and you should see a dark icon with a progress indicator (now at a new location, because it doesn't know it will be replacing an existing application). After it downloads/installs successfully, it doesn't place the blue dot on the replaced application. In my case, I had previously built this app with a provisioning profile from a developer (as opposed to an Enterprise) account. In Xcode, I changed the Bundle Identifier to give it a new name, for example, it was originally com.mydomain.myapp and became com.mydomain.mysuperapp. I uploaded the MyApp.plist, index.html, logo57.png, logo512.png and MyApp.ipa to DropBox. I shared the index.html with those who need to download the app. The user can then click on the shared link in the email and the app should install. EDIT: The issue below is a red herring. As Dylan Hand mentioned above, the problem for me was that I had broken image links in the manifest file. Apparently this didn't matter for ios7 but ios8 won't finish the install if this is true. When I removed those reference, it worked perfectly. I have the same set of symptoms as OP (ie. 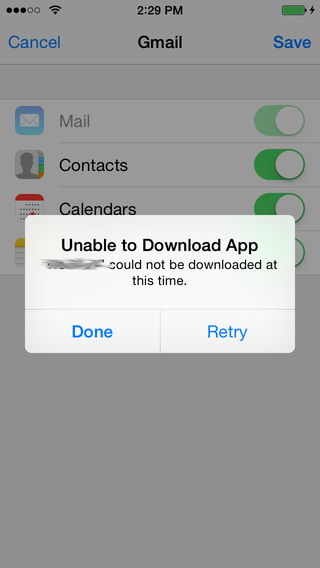 "Unable to download app" message but only on iOS 8). When I try to validate (ie Organizer -> Validate), I receive the following message. 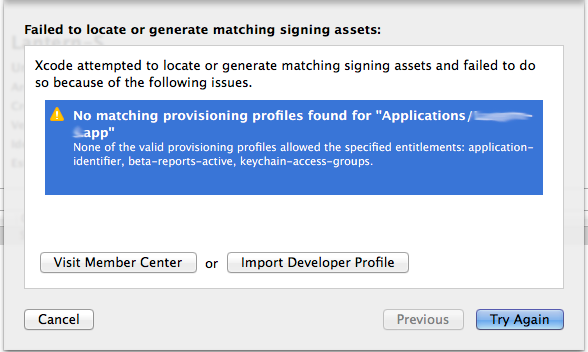 It claims that re-generating your provisioning profiles should result in a new entitlement called beta-reports-active. When I try to do this on in my enterprise account, the new profiles DO NOT have the new entitlement. However, when I regenerate provisioning profiles in another non-enterprise account, the new profiles DO have that field. If you build your iOS apps with a build script and you were previously using PackageApplication with the --sign flag then that may be causing problems. The --sign flag doesn't work any longer when building on 10.10 and removing it got all of our iOS apps installing again. This issue drove me crazy, Only this helped for Enterprise Distribution: Perform all the required build settings and click on “Archive”. Perform the Enterprise Distribution Process. You will be shown Organizer window. On Mac machine locate the .xcacrchive file by selecting KRelease and choosing “Show in finder”. User is navigated to the folder where the .xcarchive file is located. Right-click the .xcarchive file and select “Show Package Contents” option. Create a new folder somewhere on your disk with the name “Payload” Note: The folder name is case-sensitive. Paste the copied .app file into “Payload” folder. Compress the Payload folder to get Payload.zip file Rename the Payload.zip file to .ipa and bundle it with your .plist Done !!! the .ipa file is ready to be installed on the devices registered in the provisioning profile used in the .xcarchive generation. I have sovled this problem. Since Apple has changed provisioning profiles, please RENEW the provisioning profiles (File 1) and copy it into the "Payload/". Make sure there's a Entitlements.plist (File 2) in the "Payload/", and this plist file MUST be PLAIN TEXT which is created by a text editor. Copy the Entitlements.plist (File 4) anywhere else except the "Payload/". Be sure "Bundle identifier" in File 1-4 should be the same. Use this Entitlements.plist (File 4) to Re-Sign the IPA file. If you know Chinese, this will be helpful. These answers are valid things to check, but in case anyone else has tried them like I did and STILL had problems, make sure your app contains the proper plist setting that allows the exported archive to be compressed correctly. This is what bit us, even after following all the steps above. Also of note, the answer that talks about ensuring the web site's plist contains valid image links doesn't seem to affect anything, at least for us using XCode 6.3 to export archives. It worked/didn't work irrespective of those links being correct. It's obviously a good idea to have that info correct though. Another interesting note is if we exported using XCode 5, the ipa's were ALWAYS in the correct format (see linked SO article above); it seems XCode 6+ now is picky about it. My problem was corrected by removing all built outut, then rebuilding completely. Yet another possible source of this installation issue is a case mismatch between the project and the provisioning profile (especially likely with automated or other command-line builds). The bundle IDs are case-sensitive. For example, if app bundle identifier in the provisioning profile is com.example.MyApp and the project configuration and/or Info.plist uses com.Example.Myapp, Xcode 7.1 will fail with a code signing error or fall back to a generic provisioning profile (one with * bundle id, which might itself be an issue) but xcodebuild command will succeed. Jenkins will also upload the erroneously signed build to Hockeyapp for example. The build will download to client devices but won't install because of the case mismatch. Check that the application bundle identifier is set up the same way both in the project and on Apple Developer portal. The simplest way to avoid this particular issue is to always use lower-case characters in your bundle identifiers. Copying bundle id from Apple Developer portal and pasting it into the project build settings (PRODUCT_BUNDLE_IDENTIFIER) also helps of course. Though I had the issue with an enterprise account, it might in fact be not specific to this type of distribution. Make sure to check out Apple's technical note called Installation Failure Troubleshooting for iOS. Not the answer you're looking for? Browse other questions tagged ios iphone enterprise or ask your own question. How does Apple catch Enterprise Apps being distributed out-side of the corporation? How to manage Enterprise Distribution certificate expiration? enterprise app distribution using OTA give error message in safari? Can I update an iOS Enterprise App in the background like an App Store app can?